For anybody that is searching for a party bus in Rockwood, then it makes sense that you want to be absolutely certain that the company in question can provide you with a stunning experience. Here at Rockstarz Limousine and Party Bus, that is what we excel at, and with a number of years in the industry, we have a list of happy customers that have loved their time with us. When looking for that Rockwood party bus rental, then there will be various things in your mind that will play a central role in the chance for you to enjoy the experience. Well, that is what our aim has always been, and to increase those chances, we have made the maximum use of the space on our party bus. That means you can invite even more people than ever before to join you in your celebrations. Of course, when you use our Rockwood party bus service, then it also means that you can make full use of the entertainment options that are available on board the bus. From a top of the range stereo sound system to a stunning laser light show, we are fully equipped for the full on party bus experience. In short, you will feel as if you have been transported into your own private nightclub where you are in complete control of everything. 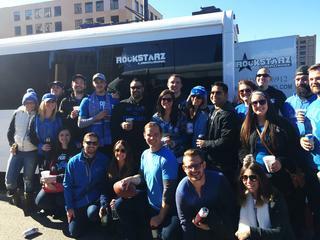 In the past, people have used our party bus for a number of different reasons. From a special birthday to celebrating a special anniversary even to a bachelor and bachelorette party. No matter the reason, you can rest assured that we will be able to cater for you right from the very outset even if you just feel like having a party with some friends and there being no real reason to do so. So, if you do live in the Rockwood area and are looking for a party bus, then make life easy and give us a call here at Rockstarz Limousine and Party Bus. Alternatively, you can contact us via our website and someone will be in touch ASAP.